After Peugeot's complete dominance in 2002, it was hoped that Citroen would be able to offer some resistance to them, especially on tarmac which had become Peugeot territory. What came about was beyond wildest dreams of rooster-fans. Citroen started the season with impressive 1-2-3 in Monte Carlo and for the rest of the year, the title fight was between Citroen and Peugeot. Far-eastern teams had quite a bad year. Mitsubishi was in sabbatical, Hyundai withdrew in mid-season and Subaru-driver Tommi Makinen announced his retirement after long spell of less than good results. 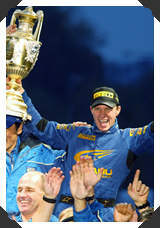 The only bright spot was Solberg's drivers title but even that nearly went to Sebastien Loeb. In retrospect, season 2003 is remembered for all wrong reasons. Mitsubishi's sabbatical and Hyundai's mid-season withdrawal were in no way related to rule changes introduced for 2004 and bitterly opposed by the teams and drivers. Expansion of the calendar from 14 to 16 events while automotive industry was scaling down in face of economical slump was surprisingly badly timed. At the same time, rule changes that were intended to drive costs down were announced too late and with too few details to allow teams to react and most had finalised budgets of some sort already. By far the biggest sensation of the year was all-new Ford Focus '03 WRC. Introduced in New Zealand, fourth event of the year and driven by young Markko Martin and Francois Duval, car soon gained fame as fastest car in the championship. Early problems meant that Martin never came about to fight for the drivers title, though. Another new car was introduced in Germany by Skoda Motorsport, Fabia WRC. Replacing old work-horse Octavia, new car was everything Octavia was not. Small, agile, unreliable and less appealing aesthetically. Subaru started the season with new 2003 model of Impreza, in which most of the changes were mostly cosmetic. Active suspension was introduced in San Remo and soon withdrawn as results weren't that encouraging. Peugeot concentrated to develop all-new 307 WRC and current 206WRC's remained in 2002 specifications through-out the season, which got Panizzi to make bitter comments. Citroen hasn't made evolutions of it's Xsara, curiously enough. Hyundai's development was on ice and eventually stopped completely.